We are your personal safety guardian and our services are comprehensively woven around your safety and security needs. We are your one point contact in myriad safety situations and while assisting you, we simultaneously coordinate with the relevant authorities and emergency service providers as the case may merit. Our 24/7 multi-layer protection is available via 24 Response App or you can even call at our toll free number at 1800-1030-024 with an assurance to respond and help at our earliest. Minor Fire, Gas Leakage, Intrusion, Loss of Keys, Any Distress Situation. Ambulance Arrangements, Injuries, Sudden Sickness, Emergency Medicines at Odd Hours. Road Accident, Car Breakdown, Loss of Car Keys, Tyre Puncture, Key Retrieval. 24 Response is India’s 1st On Demand Safety Service, which provides a Quick Response and Immediate Assistance Service to its customers, whenever they are faced with any real life situation involving Personal Safety. We provide a range of unique Safety Services available through our mobile app. You may also call our Emergency Helpline. Welcome to the safe zone of 24 Response, a personal safety app to let you move freely without paying attention to the odd hour. An unerring app backed by a series of unparalleled services, features a button called 'Safe Me', enabled to monitor your movement on your request. If needed, we send our immediate help to see you safe till the time you reach your destination. In a world full of uncertainties, Help Me promises to never leave you alone. On a single click we connect you with our 24/7 Response Center, equipped with a fully trained team on various safety & emergency issues, to provide an immediate response. As situation demands, we simultaneously coordinate with Emergency service providers. Our expert team will keep guiding you, till the time responders/service providers reach you to help. 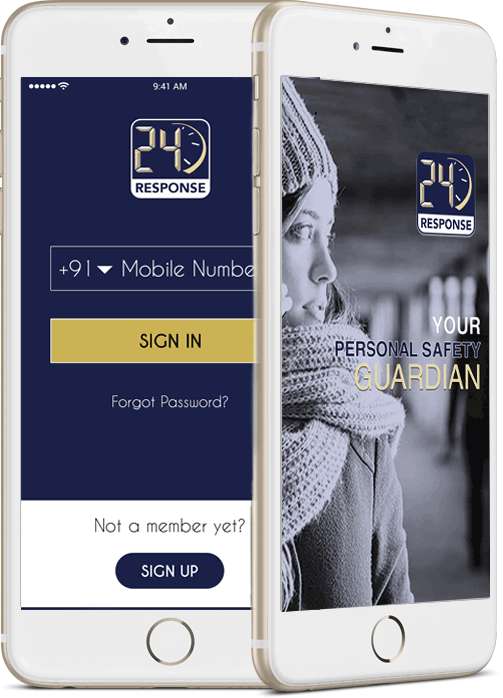 24 Response is India's 1st On Demand Safety Service, which provides a Quick Response and Immediate Assistance to its customers, whenever they face with any real life situation involving Personal Safety. Our Mobile App helps Find your location and connects you to the 24 Response Centre, while simultaneously sending out a system alert with your location coordinates to the nearest 24 Response On Ground Team. 24 Response is India's 1st On Demand Safety Service, which provides tailored emergency rescue solutions, designed by experts to cater to diverse needs and prerequisites. Whether you are looking for comprehensive emergency response services for your entire family or cater for specific emergencies, we have just the package you need.